Can Jiffy Baking Mix Be Substituted As Flour? Baking soda with cream of tartar is an acceptable replacement for double-action baking powder. 1 Can You Still Use Old Baking Soda for Making Cupcakes? 3 What Is the Purpose of Cream of Tartar in Scones? Few things are more frustrating than getting ready to bake, only to find that you're out of a key ingredient. While you may have to go to the store if you're out of flour, if your pantry is missing double-acting baking powder -- the only type available in most supermarkets -- you will usually be able to make an acceptable substitute at home. However, you may have to adjust your recipe a bit. When looking for baking powder substitutions, it's helpful to know how baking powder works. 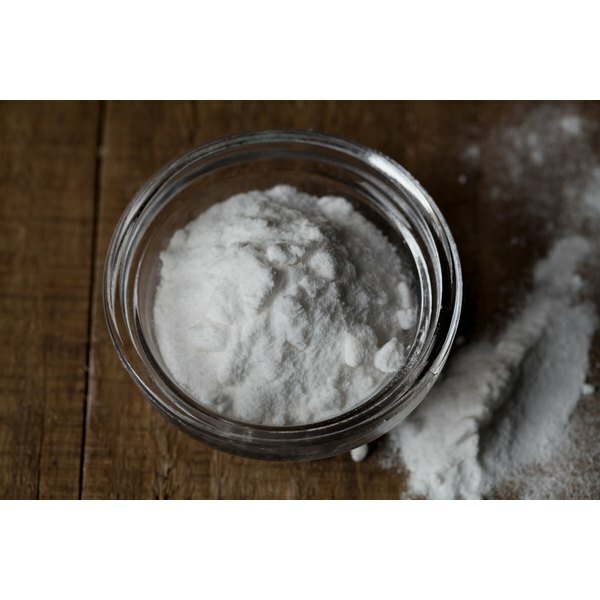 Baking powder is a mix of alkaline baking soda and a powdered acid. When moistened, baking powder -- like the vinegar and baking soda volcanoes you probably remember from grade-school science fairs -- releases carbon dioxide. Cookbook author Harold McGee explains double-acting baking powder releases some gas when it first comes into contact with moisture and another burst of gas when its temperature rises above 120 degrees Fahrenheit. Chef Alton Brown recommends mixing 1/2 tsp. of baking soda with 1 tsp. cream of tartar -- an acidic powder that develops inside oak wine barrels as the wine matures. If you're not going to use this right away, mix in 1 tsp. of cornstarch. This will absorb any moisture that penetrates the mixture and prevent the chemical reaction from beginning prematurely. If you're out of baking powder and don't have cream of tartar around, all is not lost. You also can tinker with your recipe to get the desired effect. A Colorado State University fact sheet on recipe substitutions recommends replacing 1 tsp. of double-acting baking powder with 1/4 tsp. of baking powder. Because baking powder requires acid to work and to ensure the acid spreads evenly throughout your dough, CSU recommends adding 1/2 tbsp. of vinegar or lemon juice to 1/2 cup of milk. Compensate for the milk by reducing your recipe's total liquid content by 1/2 cup. The substitutions listed here do not perfectly recreate double-acting baking powder. Brown says creating double-acting baking powder at home is prohibitively difficult. There are no temperature-sensitive acidic powders available to the average home cook. To compensate for the fact that your substitution will begin to react immediately, add the baking powder substitute near the end of the mixing process. You also should put the batter in the pan and place it in the oven as quickly as you can.